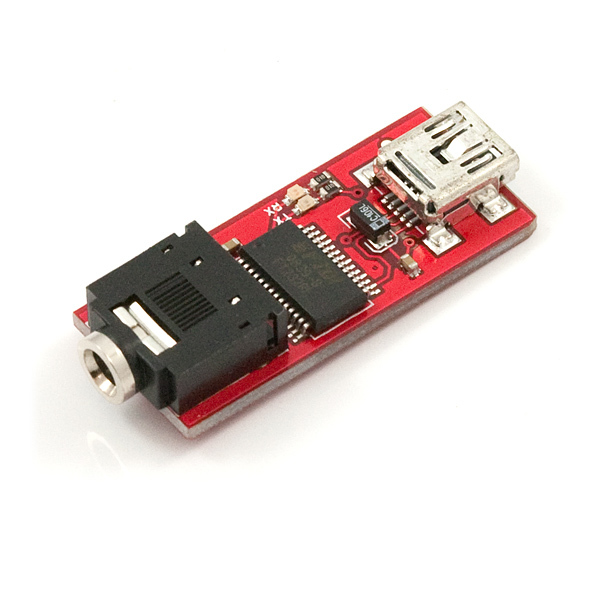 The PICAXE USB programmer allows PICAXE micros to be programmed from any platform (Windows and Linux). 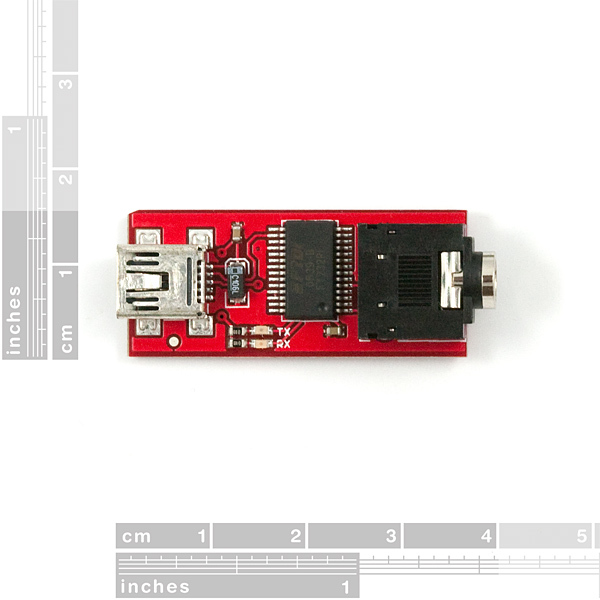 The programmer uses the FT232R and will show up on your computer as a new COM port. Under windows - you'll need to install FTDI drivers but it's really easy! This board is effectively the same thing (once you add the miniUSB cable and 3.5mm audio cable) as the PICAXE USB Programming Cable. The difference is this board has two on-board LEDs to show the serial data (TX and RX) being passed back and forth. Why buy this board? Because blinky things are better. "Why buy this board? Because blinky things are better." I'm surprised at the amount of problems people are having, but then maybe I was just lucky. I got this working successfully on Windows XP Media Center Edition, Windows 7, Ubuntu 9.10 and Puppy 5.2.5. Make sure to download and install the drivers yourself before plugging the cable in. If you just can't get it working, try uninstalling the drivers, running CCleaner and re-installing the drivers. Then plug it in. 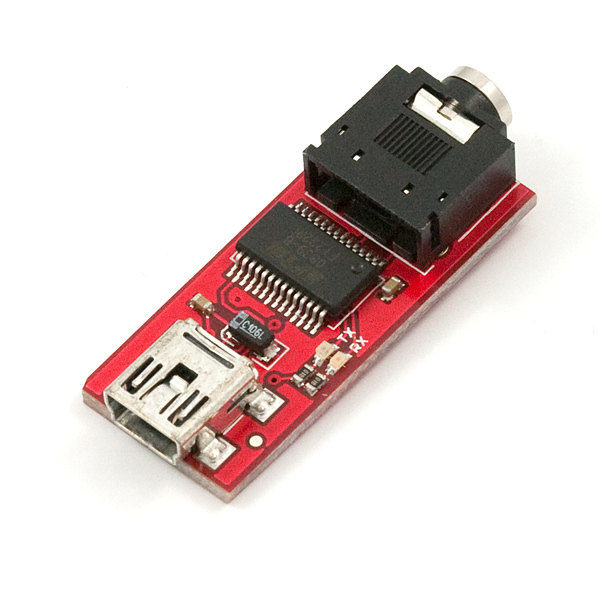 I have used this programmer successfully with the 08M, 14M and 20X2 (firmware versions C.0, C.1 and C.2). I have ordered mine and will receive this upcoming week (08/05/13). The issues seem to be Windows XP/Vista/7/8 and all Macs. Fortunately I use Ubuntu 13.04 and will be able to let the linux crowd know whether it works or not. I don't suspect I will have any issues as I plan on flashing the FT232R to work with PICAXE right out of the box. Also I will be desoldering the Audio Jack and substituting it for a more appropriate header. For more info on the Headers swap, refer to my previous post mentioned below. Hope this helps any of you out in your buying decision. The comments here are not hugely encouraging. Has anyone had success with this gizmo on a Mac w/ MacAXEpad? I just purchased one of these and received it yesterday 4/1/13. I am running on a MacBook Pro with Mountain Lion (10.8.3) and FTDI kernel extension 2.2.18. I was able to get this to work with a PicAxe 08M2 and AxePad 1.5.0. I had to solder a jumper wire (from pin to pin) on the FTDI chip to connect RTS to CTS (I didn't have to connect DSR to DTR in order to get it to work, but I did anyway for my final solution.) I eventually found this hint somewhere on the web, so thanks to that poster. It would be nice if this board gets rev'ed to have some pads or holes to connect RTS to CTS and DSR to DTR for the Mac users. It worked fine without modification on my Windows XP side. I'm thinking that the AxePad SW doesn't configure handshake on the port properly or something. I also had to bring up my VM with windows XP and run FTDI's FT_Prog to program the FTDI chip to properly drive the Tx/Rx LEDs - they weren't configured properly when I received it and were constantly on (SparkFun may want to investigate.) I have programmed my PicAxe several times after making these modifications. You did what? How? Why wasn't I warned about this? Those are tiny pins. By the way, THANKS. This really helped me. Thanks! I ended up going with the expensive cable instead to avoid the headaches (I hope...). Blink. Blink. Blink. Blinky Better! Its Scientifical! :P This looks great. Thank you SF for the cheaper board. I am using for a Science Fair experiment, and looks like it is going to work great! what type of PICAXE, how many pins? Is it possible to use this to provide power your PICAXE project with the USB as the power source? Also, perhaps I'm totally missing something-- Couldn't the TX and RX go straight from the FT232R to the PICAXE eliminating the need for the 3.5mm audio jack? This is what I am really wanting to know. I looked at the schematic they have and my thinking is just make a cable/dongle with 5V/GND/Tx/Rx so basically 4 wires, and rig them up to a USB cord. Essentially it's the same thing. I'm still going to get the board but remove that audio jack and swap for headers or something. There's a via on the board so it might require putting them in two chunks. My thinking is to take a 6-female header across it to bridge that gap with only using one cable/device. You'd have an extra pin. From the looks of it an extra pin/slot won't interact or mess with the board in any way. In any case, it's worth considering because this board is really nice but that 3.5mm audio jack is just horrible looking and really is an extra thing I'll have to buy; not something I'm interested in regardless of the price. Extra crab on my desk is extra crab, whether it's $10 dollars or 10 cents makes no difference. Should I work this out I will post it. I have one of those for my PICAXE but I was wondering if I can rewire it to program my ATmega328p chips. I'm having problems also. Using either iBook G4 or MacBook Pro, it doesn't work. Tried with homemade Picaxe board and board from Picaxe, doesn't work and so purchased a AXE027 USB cable and it worked on both boards. Didn't matter whether it was an old driver (the one downloaded from the Picaxe website) or the most current website (FTDI website). Sparkfun needs to get this sorted out. Why is VCCIO tied to 3.3v? On the official USB PICAXE cable, it is tied to 5v. Is it a mistake in the schematic? Is it a design mistake? Is it better to use 3.3v IO levels? I have a 3.3v SFE "FTDI Basic"; can I use that to program PICAXEs? Do I need to worry about the fact that TTL UART, and RS232 use opposite logic levels? I installed the FDTI drivers on both my Macintosh (10.5) and Vista machines. This adapter works fine on the Vista machine, but it doesn't work at all on the Mac. The MacAxePad can find the chip, but it can't program to it. Can't get this to work under either XP or Vista. I've uninstalled it in XP, but it allways wants to automaticly install when I hook it up, even when removing the drivers and dll's in system 32. How about using CCleaner to clean up any other files that may be hanging around on your system? It's saved me more than once. 1. Make sure you solder together your starter kit or PCB properly, it will report "hardware not found" if any pins on the chip don't connect properly, and double check the program/run jumper is soldered properly. 2. I made this device operate properly under Ubuntu and XP Pro, please refer back to tip one before chasing USB ports, drivers and other PC related issues if you get "hardware not found on USBxxxx" type errors. great little programmer. it didnt work at first but once i reflashed the FTDI (got from sparkfun support) it starting working like a dream. i haven't had any problems since with any of my PicAxes (08M,14M,18x,40X2). BTW: Would be better if the stereo plug was a male rather than female plug for use with PICAXE breadboard adaptor, or include the breadboard adaptor circuit and header pins on this board. kewakl: _Works. Windows Vista 32 Home Premium. Used the VCP driver here. will have to check with this DL breakout and report back. Works. Windows Vista 32 Home Premium. I have a few other Picaxe chips. When I build the programming circuit for them, I will report back with success/failure. stay away from this. tried it on 3 separate computers and still won't work. 1st one is window 7 RC, recongized driver automatically, both the serial converter and virtual com port is showing up fine, but when time comes to reprogram, logicator/basic program keep saying can't find hardware. 2nd one is window 7 RTM, have to manually install driver from FTDI, seems ok from device manager, but again, downloading is no go. Last tried it on a window xp sp3. Installed FTDI driver, device manager shows it's ok, still doesn't work. Save some headache and go with the authentic AXE027 cable. I agree, stay away. It seems it works for some people and not for others.Tried on a XP and Visa computer, both serial and virtual com show up, but it won't recognise the Picaxe project board. Can't tell you the amount of frustration I put into this thing. 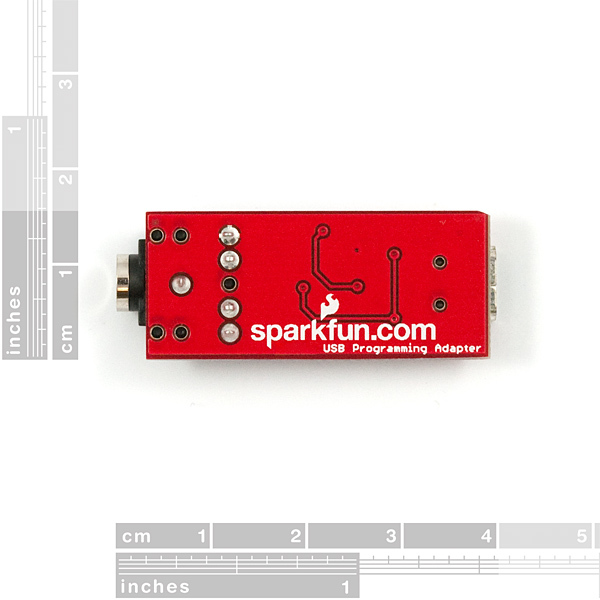 Worse than that, Sparkfun never responded to an e-mail I sent them about it. I will get the authentic AXE027, but from Robot Shop. I won't deal with Sparkfun again. I'm having similar problems. It seems to communicate just fine, reporting the firmware version of the picaxe, but downloading any programs is a no go. I'm very disappointed but open to the possibility that it may be something else I'm doing wrong. I have posted in the forum if anyone has any ideas. While many cellphone device manufacturers are making micro-b the new 'standard' the main purpose is to make devices thinner, rather than for any real convenience. This is also to be the new cellphone standard, so you don't need 4 cables for 4 different makes of cellphone, just one. as this board has no need to be thinner or shoved into a cellphone, i very much support its use of mini-b, especially given i have who knows hwo many mini-b cables laying around. Good feedback, but that's like asking the US to change all their power cords from 2-prong to 3-prong. Is microUSB all that much better for the general electrical device? SparkFun will change! Change will happen. But it's going to take a long time. TBH, I've yet to see a MicroUSB device, cord, or socket in the wild. I'd think that the MiniUSB as used here is sturdier and more resistant to wear or breakage from (ab)use. There really isn't a reason to move th MicroUSB, as the connector fits on this board, and fits rather nicely. Now, if it were a USB-B connection, then I might advocate moving to MiniUSB; however, each standard USB plug serves a purpose, and I really don't think that having a smaller plug would be of any benefit whatsoever. I have MicroUSB in my BlackBerry and it is rather fragile than sturdy. Anyways, does the size matter so much? "...any platform (Windows and Linux)"? How about Mac?